Spring is in the air, and a Birthday Giveaway! Hey there ladies! I’ve been a little MIA on here lately trying to get settled here since our big move. I am happy to say that spring is finally making its approach to NJ and I am loving it. Is it just me, or does anyone else think it should be illegal for mother nature to allow snow before the month of December, and after the month of December? Just saying. Hi friends! Today I am so excited to share this awesome giveaway with you! For my 29th birthday I decided that I wanted to do something fun since it’s my last year in my 20s. So why not give you guys a bunch of free stuff! There’s not just one prize up for grabs today, but EIGHT amazing prizes (or shall I say birthday gifts) from me to you! I’ve teamed up with some of my favorite companies and favorite bloggers to share this with all of you! Thank you for making blogging worthwhile for me and following! I love you all! I love your top and skirt! The white is gorgeous 🙂 I completely agree with the no snow thing! The heels are stunning! Makes me feel like spring is finally here! You look stunning – I love that white dress with jewels… Also, I agree, the snow needs to be long gone in NY/NJ area. My birthday is in December so i'm not too sure yet. I would be happy with any of these prizes, especially the swimwear. I'm going on a few vacations this summer and will definitely be needing a new bathing suit! My birthday is in June so all I hope for is sun and fun! I'd love any clothing or swim wear prize!! Anthro or Bella Ella! Birthday is in sept! I hope to celebrate my birthday with my fiancé (as of March 13 :))!! Our birthdays are in September and one week apart. 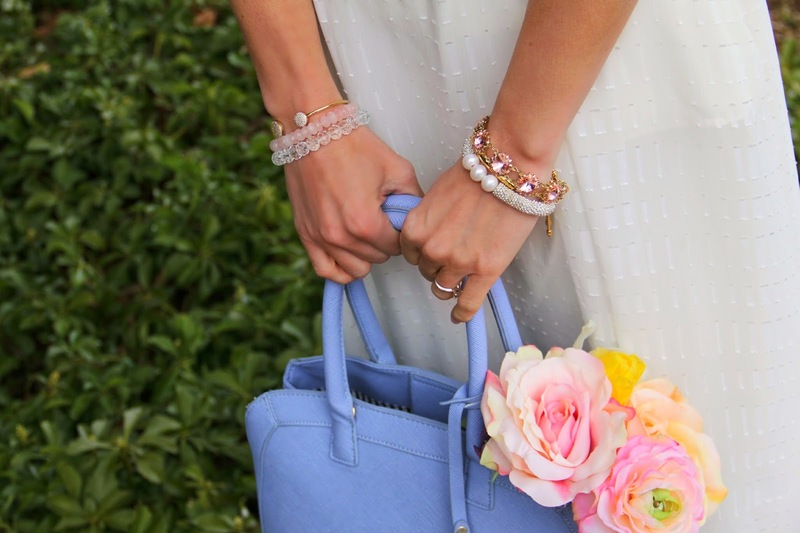 This whole look is so darling with the spring pastels in the accessories. I love your outfit. Your bag is so beautiful. Happy weekend! Happy Birthday to Krisitn! And congrats on your move, hope you are all settled! I am in Denver and hate snow after Christmas too! I always spend my birthday blissfully shopping with my birthday money kid free at Anthropolgie for the whole afternoon! It is my favorite day of the year! ? I would love to spend my birthday taking a weekend getaway – kids free. Momma needs a break! And I would love to win the Anthropolgie gift card! My birthday is in December so we always celebrate my half birthday too! I have a 2 week old baby and an almost 4 year old so I'm hoping to celebrate with a pedicure and dinner at my favorite sushi restaurant. And I'd love the anthropologie gift card! I visited pink blush and might actually want to try a maxi dress: the FUCHSIA WHITE PRINTED MAXI DRESS is cute!! My birthday isn't for another 6 months so I'm not sure what I will want to do. We just had an anthropologie open so I'd love the gift card. I want to have Sprinkles Cupcakes for my birthday this year. And I'd like to win the Anthropologie Gift Card — I love their stuff, but it's so pricey. So cute love the bag! Happy Birthday! I plan on spending my birthday with my family this year and doing a dinner party at Gracias Madre in West Hollywood. I would love to win the Anthropologie gift card! The bracelets that you paired with your outfit are so lovely. So cute your heels! And I like your hairstyle!